Kazakhstan is a major wheat exporter in Central Asia, therefore sustainable climate-resilience in the national agriculture sector is a safeguard of food security in the whole region. This regionally important role puts Kazakhstan on the map of globally significant link in grain production: Kazakhstan is currently the world’s ninth largest producer, and seventh largest exporter, of wheat. However, rising temperatures due to climate change and inaccurate weather forecasting in the next several years may lead from 50 to 70 percent crop losses in the region. The UNDP/USAID project “Improving Climate Resilience of Kazakhstan Wheat and Central Asian Food Security” was started in 2012 jointly with Kazhydromet National Hydrometeorological Agency with the aim of improving forecasting capacities to help improve crop yields in the region. Other key partners include the Kazakhstan Ministry of Agriculture and Kazagroinnovation JSC. Improved forecasting capacities enable farmers to plan for sowing and harvesting times, magnify crop growth, improve people’s access to food and provide opportunities for income growth. Thanks to new effective technology transfer chain developed by the project around 70 farmers are now obtaining target volumes of wheat harvests in the Kostanay region. A Geo-portal containing imaging and map-based data to better assess drought-affected areas is being established by the project. Until recently, weather forecasters in Kazakhstan relied on the vagaries of an age-old manual system that was inhibited by worn out maps and indecipherable hand-written data. To make a weather forecast for a particular day forecasters had to find information about a similar day in the past. This meant going over a lot of material about a similar year, season and time. Longer-term climate forecasting required several months to select necessary numbers. This UNDP/USAID project developed specially designed software that selects and presents the required map 20 times faster than the most agile person, helping to significantly reduce the workload of staff and deliver more timely weather forecasts to farmers. As part of its broader goal and objectives this project has also supported the collaborative initiative of the National Center on Space Research and Technology to help build a web-based information management platform to enhance the delivery of drought information to farmers, enabling them to better plan and manage their farming production systems. As part of this collaborative initiative the USAID/UNDP project has consolidated the concept for the development of a geoportal, whose main aim is to improve the present system of weather and climate data information delivery as a self-driven mechanism covering not only for Kazakhstan but also other Central Asian countries. This geoportal system is conceptualized to post updated cartographic and climate data information to define optimal planting times and better track and monitor the drought season in the wheat production sectors in Kazakhstan. To support to roll out of the geoportal five representatives from the National Center on Space Research and Technology recieved a ten day specialized training programme on the development of geoportals for improving the early drought warning system in close cooperation with the Spatial Development International Inc, based in Seattle, WA, USA. In 2013 in North Kazakhstan Abi Zher company demonstrated a crops cultivation technique that used methods recommended by the project in cooperation with Kazhydromet and involving new forecasting data. This technique used no-till (or zero) tillage farming, a modern agriculture method in which the top soil layer is not loosened and the soil surface is typically covered by the crushed remains of plants — mulch. It helps to prevent water or wind from eroding the soil and reduces water loss from the soil, providing increased resilience to drought. Despite suffering from the effects of climate change, with early spring droughts causing significant problems, there is currently a lack of opportunities and incentives for farmers in Kostanay region to use more modern farming technologies. In response to this the wheat resilience project decided to select pilot plots and demonstrate advanced adaptive wheat growing technologies that are resilient to different climatic shocks. These pilot plots were based in Shortandy, Kostanay and Petropavlovsk, where farmers could not harvest target amounts of wheat because of climate conditions. Through these pilot plots the project helps farmers to make decisions on what crops should be sown, when and how the land resources should be used more efficiently. Experts predict that climate in Kazakhstan will be more arid and that crops will need more access to soil water. In response to this the Government of Kazakhstan, in conjunction with this UNDP/USAID joint project, is developing a drought monitoring system. The system will take the form of a geo-portal and will include processed imaging data from climate scientists combined with geographical maps. The resulting maps will depict moisture levels, with moist areas marked by dark shades and light areas indicating appraoching drought. Farmers will be able to use it to assess the situation and change their planning schedules accordingly, making them better equipped to tackle extreme and unavoidable weather events. 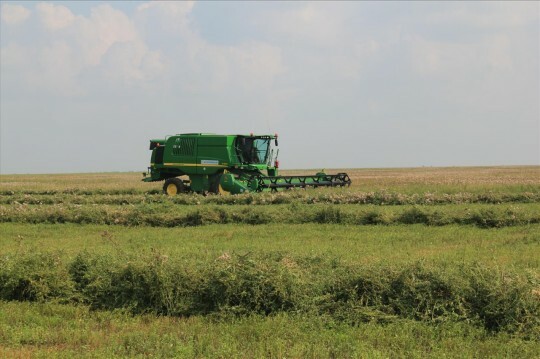 Monitoring technologies with use of maps-based and imaging web services will make information on grain production more accessible, which is very important for Kazakhstan’s integration into the global agricultural market. The official launch of geoportal took place in July 2015 in the administrative building of the National Center for Space Research and Technology in Almaty, Kazakhstan. Kazakhstan is the first country amongst the Eastern and Central European nations that would have such a comprehensive web based information management platform. Improved weather forecasting, the introduction of no-till agricultural techniques and adoption of new technologies has significantly improved crop yields in Kazakhstan. Using traditional technologies Kostanaysky Research Institute of Agriculture previously achieved spring wheat harvests of 12 hundredweight per hectare (~0.61 tonnes/ha) on average (over a 10 year period). The transition to no-till farming methods has helped to increase this figure to 20,5 hundredweight (~1.04 tonnes/ha). When no-till technology started to be used alongside improved weather forecasts the average yield of spring wheat added up to 26,8 hundredweight per hectare. Overall, no-till technologies combined with more accurate forecast data helped to harvest 2,7 tonnes of high-quality grain per hectare compared to the average yield of 1,4 tonnes.